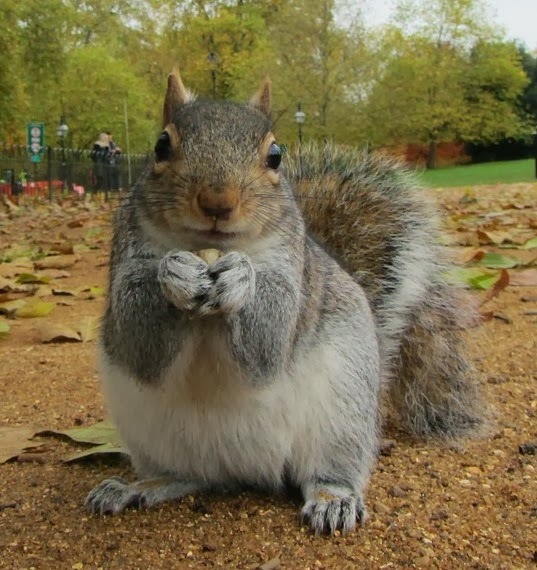 Apparently, today is National Squirrel Appreciation Day. Mind you, this should not be confused with National Squirrel Awareness Month celebrated each and every October. Faster than a bumper car, more powerful than a locomotive, and able to leap 20-foot buildings in a single bound! Well, except for the locomotive part. However, they can grow their mighty chompers 6 inches per year! Feeling a little less super now, Superman? And how about their knack for finding all those hidden nut hoards? Well, it’s been recently discovered that right before stashing nuts, squirrels lick them and rub them all over their little faces. who's been using this move to protect Milk Duds, Skittles, and Snickers bars since we first stepped out of the cave. PROMPT: Get inspired by a few episodes of Rocky and Bullwinkle or treat yourself to The Nut Job on the big screen. Then come up with a super squirrelly character who… gulp!... just teamed up with your little brother. There’s Gold in Them Thar Words!